My name is Steve Allen (Class of ’74). Recently we started working on our plans for our F35th reunion to be held on Friday, November 27th, 2009. Specific details regarding place, costs, time, etc have yet to be established. However, as a result of the planning, and since I have my own web/graphic design company, I am responsible for all internet communications. 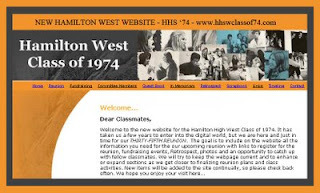 Again, since my company designs websites, we created a site for the class of 74 (www.hhswclassof74.com). It just went “live” this weekend and still have some pages to complete. The reason for my e-mail is to see if you would be willing to mention us in your blog. 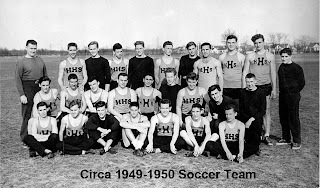 In return, I have created a link on our site for “Links” which I will be placing Classmates.com, the Official HHSW website and Alumni site and would be more than happy to add your hhs51 blog if you would like. This June 10th we will be having our first fundraiser at Applebees on Rt. 33, from 11am till 10pm with 10% of each bill going towards our fundraising efforts. Within the next day or two I will have the flyer online that everyone needs to take into the restaurant in order to get the donations. Of course we would appreciate any publicity your blog could offer as I am sure you have numerous fellow hornets that are avid readers of your blog and would be willing to help out by dining out on that day. There's Tommy Corelli on the far right, Jack Pierson on the far left. I also see classmates Donnie Frounfelker, Ronnie Lynch, Kieth Kauffman, Paul Henon.....Memories of our youth!